Corpse Party: Book of Shadow is a horror adventure game developed by MAGES, formerly 5pb with supervision provided by Team GrisGris who are the original Corpse Party developers. It is published by Marvelous USA (formerly XSEED Games) in North America. It is the third game chronologically in the series. Consider this game a sequel, prequel, and alternative timeline wrapped up into one. The game itself features a time loop that runs parallel to the events in the previous two entries. The story features a group of school students transported to a hellish landscape after a culture festival cleanup. The kids perform a friendship ritual for a classmate who is transferring and accidentally travel to a twisted nightmare realm. In Corpse Party: Book of Shadows you take control of Naomi and guide her through the hellish reality presented after the games first chapter. Honestly, I was not prepared for Corpse Party, I really wasn’t. This game was brutal, fascinating, and downright disturbing. I had to stop myself multiple times just to deal with what I was experiencing. 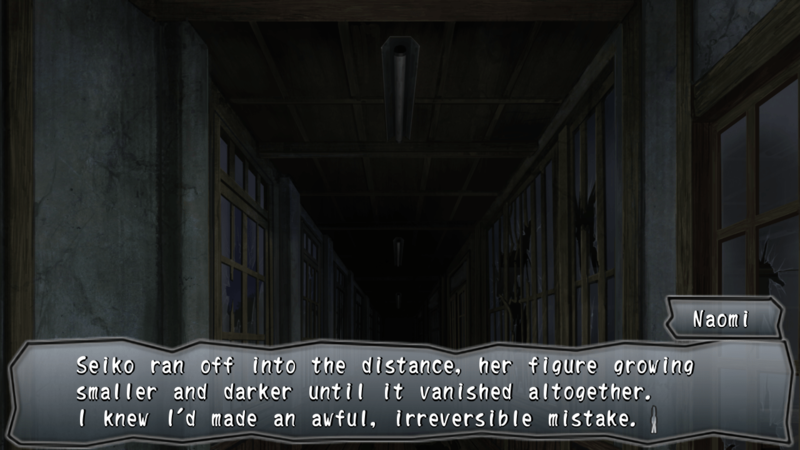 There is absolutely no experience that comes close to the existential dread of Corpse Party: Book of Shadows. My main caveat is the opening sequence feels out of place in tone and mood compared to the rest of the game. The opening sequence consisted of a previous character Naomi refusing to interact with her mother and freaking out over the loss of her classmates and supposed denial of her imaginary friend Seiko. I couldn’t tell if this scene was after the events of one of the first three two games, or after the events of this one. The first chapter establishes Naomi’s friendship with Seiko, who we find was in fact alive after all. This opening was difficult for me to get through, because of some questionable bath scenes that could have implied more than shown. I don’t really enjoy H-esque scenes, let alone ones featuring young looking characters. Granted, a lesbian undertone is a welcome one, given that most other visual novels tend to keep things strictly heterosexual. Besides the confusion with time travel and the opening bath scene, the rest of the game is downright disturbing. I had several issues during gameplay with how graphic and gruesome some of the scenes ended up being. I’m a horror buff but there were a lot of moments that I just found disturbing and downright frightening. The stories featured in the various classrooms and through the various chapters are unsettling and creepy beyond belief. This is a testament to the art team and the willingness of the developers to go the extra mile in making this game truly horrifying. Corpse Party: Book of Shadows features beautiful CG portraits and these excel in scenes during major dialogue and important events. I personally loved the models and the CG portraits were outstanding. The backgrounds perfectly complement the creep factor and even though a lot of the walls looked the same, I was disturbed each and every time search mode allowed me to look around the room. I think this is absolutely a reason why people consider Corpse Party to be a very popular and well recognized doujin, or hobby, game. The quality of the scenes and characters is absolutely outstanding. The music is very unsettling and has many memorable tracks. I had to stop at one point because the anxiety of what was going to happen had me too freaked out. Playing this in the dark is a must for me and greatly added to the atmosphere and unsettling story. The creep of the floorboards and thumping of footsteps helps amplify the tone. The music alone really sells the atmosphere. Each and every exasperated noise from a character added to the despair and terror they were experiencing. All of the victim scenes and the protagonist’s hesitation upon discovering them blew me away. Every single titular disgusting moment of horror was no doubt memorable. The voice acting was phenomenal and the entire Japanese VA cast brought their best efforts this time around. 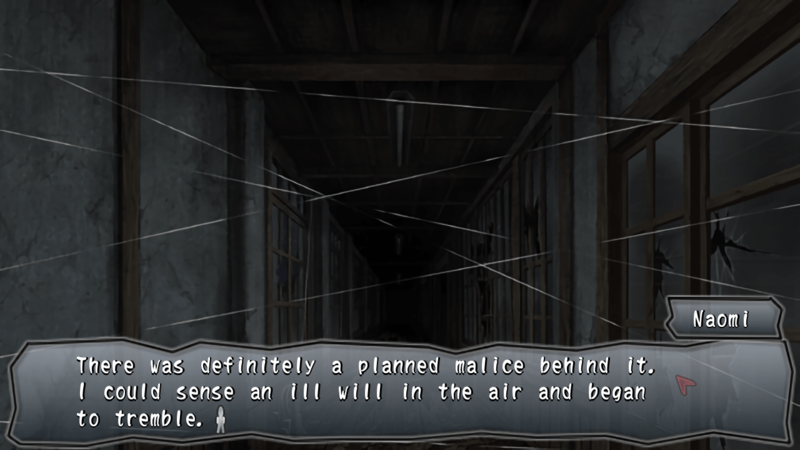 The gameplay for Corpse Party: Book of Shadows consists of interacting with dialogue options during talks with characters and environments in your quest to solve this mystery. Certain hallways and rooms will allow you to search for items and interact with objects, giving more life and despair to the room you are in, or the characters specific to that sequence. I had no issues with the controls and everything was quick and responsive, which is completely necessary in a game that takes full advantage of your time and is so immersive. This is a game that requires complete attention and demands that you stay sucked in to the experience at all times. I mapped the controls to an Xbox 360 controller and everything was smooth and responsive. The text menu does its job well and the design of the backgrounds and font add to the overall creepy presentation. You are able to fast forward through dialogue if you so choose and the game does save automatically after major decisions are made via dialogue options. I found myself thinking about this game often outside of when I was playing it, which caused me to anticipate it both positively and negatively. I found myself excited and anticipatory towards the scares and the impact of them was amplified by how unexpected everything ended up being. I also found myself dreading this game at times, not wanting to experience dread and sadness can be a very motivating factor in avoiding a game. I began this game thinking that I would be lost without having played the previous game. By the end though, the story did wrap up in a mostly self-contained way. I still had questions that I bet the previous game would answer. I was compelled enough to finish at least one ending with all chapters done at about ten hours. The writing was well done and the translation, as far as I can tell, was liberating enough to be understood with just a basic knowledge of Japanese culture, and yet familiar enough in English to get the gist of what I didn’t know easily. Corpse Party was definitely an experience for me. It was my first foray into horror visual novels and it certainly won’t be my last thanks to the tight and consistent quality behind the art, design, dialogue, story, setting, music, and controls. Corpse Party is a fantastic game and deserves to be played by more of those who enjoy visual novels and adventure games. For those who can’t stomach the darker things in life, I would suggest you steer clear of this franchise as a whole because what is here is definitely dark and definitely unsettling. 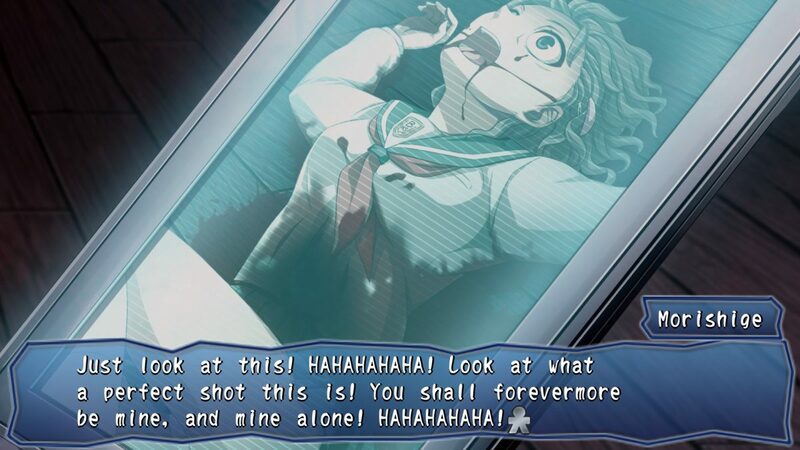 For my money, Corpse Party: Book of Shadows gets a very well-deserved and solid 5 out of 5. I was scared the entire time, absolutely exceeded my expectations. It’s available on Steam currently for $14.99. JRPGS are my jam. I'm a huge fan of dungeon crawling and giant robots. An elusive Help desk support technician who plays games when his kids are asleep. Surviving out in sunny California.